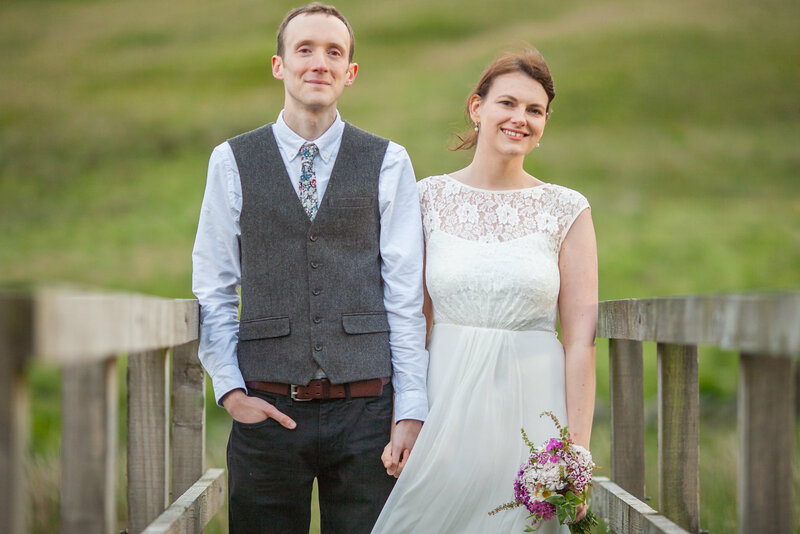 This wedding photo was taken on the moors above Hebden Bridge. I was trying to use the bridge for leading lines, to give a bit of depth in the picture, as well as lead the viewer’s eye to these guys in the centre. We were up on the Calderdale moors, near to the two reservoirs, Gorple and Widdop. We tried a few different pictures on the bridge and near the water. The sun was setting at this point, so we got a nice mix of shots in direct sunlight, as well as soft light when the clouds moved overhead. These guys were really adventurous in exploring the area. They were enjoying trying out different locations, and were great at walking about in their finery. I manage to slip and fall down a hole, but they remained graceful throughout!